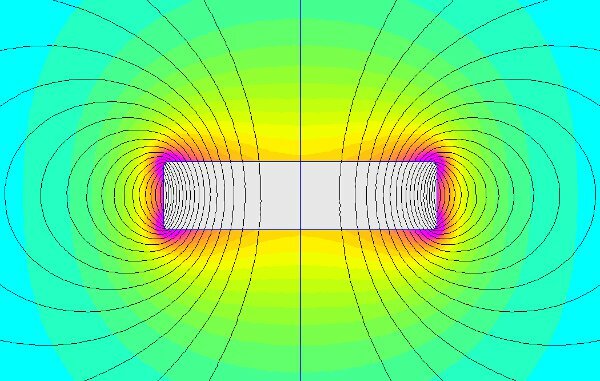 In this article, we discuss a few things that might make you question what you think you know about magnets. We’ll show magnets stronger at the edges than at the center. We'll see magnets that won’t attract to center upon one another. We’ll even make the north pole of one magnet stick to the north pole of another. The forces between magnets have long fascinated us. It is a strange thing to think about: forces that you can’t see can cause things to move. Albert Einstein described his first interest in science stemming from his fascination with a magnetic compass at a young age. When we think of magnets, most of us think about how they work in terms of an analogy: We might think of magnets as having invisible mechanical springs between them. Or we follow simple rules that apply in most situations: “Opposites attract” or “the north pole of one magnet attracts to the south pole of another” to predict their behavior. How much will a magnet pull? This question is one of the most basic inquiries one can ask. The answer, however, can quickly get complicated. It depends. When we list Pull Force of a magnet on our website, we are referring to the pull force in a very specific situation. Pull Force, Case 1 is the force required to pull the magnet directly away from a big, thick steel plate. Pull Force, Case 3 is the force required to pull one magnet directly away from another, identical magnet. If your setup is different than these specific cases, you can see very different results when you measure pull force. We explicitly describe the conditions required to see this performance as a way of limiting the scope of our answers. What about magnets with two different sizes or shapes? How much will they attract or repel? How do you figure that out? We always figured this would be a cool project: build a magnet calculator that would predict the force between two magnets that are not the same size. Every time we try attacking the problem, though, we find strange exceptions that make the task difficult. Magnets do weird things that aren’t easily described in a single pull force number. Magnets are weird. First, let’s consider a simple case: If you have two magnets attracting to one another that share the same (or nearly the same) diameter, they will attract with a pull force somewhere between the listed pull force values. Typically, the result is closer to the smaller number. 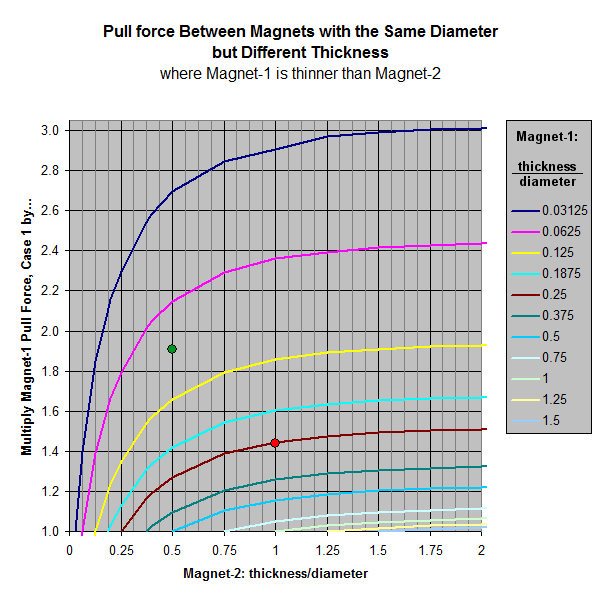 While we haven’t built an online calculator to answer this question specifically, we offer the chart below to help estimate pull force between magnets with different thicknesses. It can help make a reasonable estimate. Let’s look at a few examples to demonstrate how to use this graph. Consider a thin D82 disc magnet stuck to a D88 cylinder magnet. How much pull force is required to pull one from the other? First, let’s call the smaller magnet (D82) “Magnet-1.” Take the thickness and divide it by the diameter to get: 0.125 / 0.5 = 0.25. 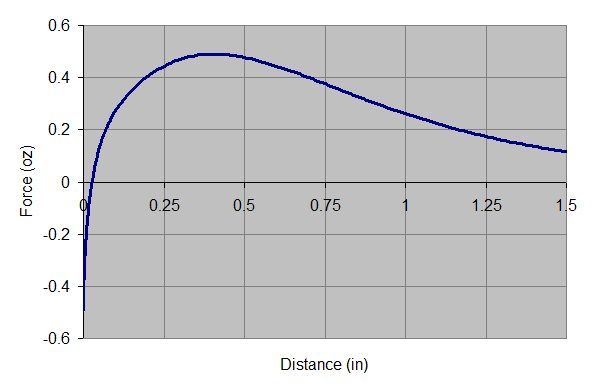 Use this 0.25 number to pick the appropriate curve on the graph to use. We’ll use the reddish-brown, 0.25 curve on the graph. Next, the D88 magnet will be “Magnet-2.” It has a thickness/diameter of 1, which is where on the horizontal axis our point will be. We marked a point on the reddish-brown 0.25 curve at the 1 on the horizontal axis with a red dot on the graph. Finally, look where the red dot lines up with the vertical axis (left side) to find the multiplier. In this case, it looks like the multiplier is roughly 1.44. To find the pull force, multiply the listed Pull Force, Case 1 of the smaller D82 magnet by 1.44. So 6.44 lb x 1.44 = 9.27 lb. Therefore, it should take approximately 9.3 lb of force to pull a D82 magnet away from a D88 magnet. Let’s consider a second example with a thin DC1 magnet and a DC6 disc. Again, how much pull force is required to pull one from the other? We calculate the thickness/diameter numbers of the DC1 and DC6 magnets as 0.083 and 0.5, respectively. Which Magnet-1 curve on the graph should we use? There isn’t a 0.083 line, so estimate that the point is somewhere about midway between the pink 0.0625 and yellow 0.125 lines. Next, the larger DC6 magnet’s thickness/diameter number of 0.5 means our point is above the 0.5 on the horizontal axis. This location is marked with a green dot on the graph. This looks like about 1.9 on the vertical axis on the left. Multiply the DC1 magnet’s Pull Force, Case 1 of 4.95 lb by this multiplier: 4.95 lb x 1.9 = 9.41 lb. It should take approximately 9.4 lb of force to pull a DC1 magnet away from a DC6 magnet. Why don’t we offer a similar graph or calculator for magnets with different diameters? Because a list of pull force results for this would not be a great indicator of what actually happens. When experimenting with magnets that have very different diameters or shapes, the forces you feel are not always easily expressed with a single number. The whole point of having these answers is to help figure out how a magnet will work before trying it out (or get close, anyway). We could make a calculator that calculates the force between two magnets, but it would have to assume you hold two magnets perfectly aligned, on axis with one another. In practice, if your setup doesn’t do this, an answer in the form of a single pull force number would be very misleading. 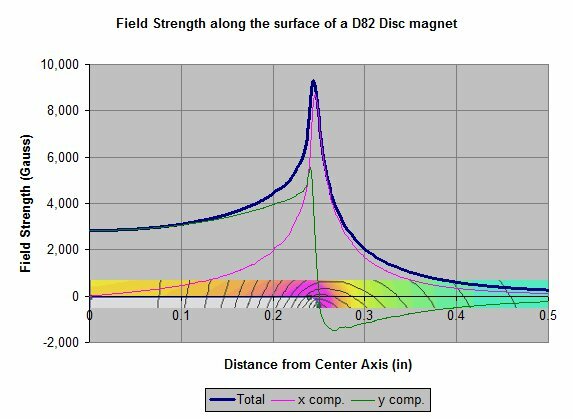 Consider this: The magnetic field on the surface of a disc magnet is not uniform. In fact, for big shapes, it is often substantially stronger at the edges. What does this mean in practical terms for someone who just wants metal to stick to the magnet? For one thing, when you stick a small piece of steel to a big disc magnet, it will tend to stick to the edges of the big magnet where the field is strongest. In the video below, we show numerous steel balls attracting to a big disc magnet. This tendency of sticking to the edge of the larger magnet is also true of magnet-to-magnet attraction, where a much smaller diameter magnet sticks to a larger magnet. This effect happens more with thin shapes. With thicker magnets, the effect is less pronounced. Really Weird: You can make the north pole of one magnet stick to the north pole of another! This effect shows itself with relatively thin magnets where one has a much larger diameter than the other. To illustrate, we’re using the 2” diameter x 1/8” thick DY02 magnet and a few smaller magnets: D68PC-RB, D41 and D81. A DY02 and a D41 disc magnet with their north poles facing each other. Why does this happen? Not to be flippant, but, well, because it does. That’s what two magnets do in these shapes in this setup. The question is interesting only because it doesn't agree with our common way of thinking about magnets. Think of the force between the magnets as 2 separate forces that add together. The first force would be the repulsion one expects between two magnets with the same poles facing one another. It’s smaller than you might expect because the big magnet’s magnetic field is weaker in the center. Still, it’s always pushing the little magnet away. The second force could be the attraction between the little magnet and the material of the big magnet. For example, if we used an un-magnetized disc magnet for the big one, the little one would still be attracted to it, just like it attracts to a piece of iron. The magnetic force attracts towards the material, but decreases as the magnets get farther apart. Repulsion force between a DY02 and D41 magnet with like poles facing one another. Negative values indicate attraction. Thinking of it this way might explain the behavior. When the little magnet gets really close to the big one, the attraction of the little magnet to the material in the big magnet is just enough to overcome the weak repulsion force at the center. This behavior isn't something you might predict just thinking about magnets; you have to get some and experiment with them for a while to discover this sort of thing. Magnets are truly weird!